Kazakhstan is a vast country, covering an area of well over 1 million square miles (2.7 million km²), or the equivalent of more than a quarter of the size of the entire United States! Yet it has a population of just 18 million. A former Soviet republic, it has been an independent state since 1991. The population of the country is 70% Muslim and around 25% are Christians, most of whom belong to the Russian Orthodox Church. Catholics make up only a tiny minority of some 300,000 souls. At present there are barely 100 Catholic priests for the entire country, serving in the four dioceses of Kazakhstan. Most of these are the descendants of former Polish, German, Baltic or Ukrainian people, deported here under Stalin and others. Kazakhstan is today an exceptional and happy example of friendly coexistence between the Catholic and Orthodox Christians and there are many positive encounters and joint initiatives between them. Therefore, it was, just recently, for the feast of the Orthodox Christmas, which falls on 7 January. Bishop Jose Luis Mumbiela Sierra of the diocese of the Most Holy Trinity in Almaty, who is also chairman of the Catholic bishops’ conference of Kazakhstan, met together with Russian Orthodox Metropolitan Alexander to congratulate him and express his best Christmas wishes on behalf of all the Catholic bishops, priests and faithful in the country. Gifts were exchanged and the two men spoke together about some of the important issues facing both Churches at the present time. 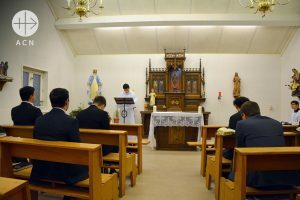 The challenges facing Christians today are also keenly felt by 12 young men currently preparing for ordination to the priesthood in the seminary in Karaganda – the only Catholic seminary in the country. The seminary has asked for our help in providing theological books for the seminary, so that these future priests can enjoy a solid and rounded formation. We have promised $2,250.